For the newcomer to polo, this 2,000-year-old game may well seem foreign, disorganized and described in an incomprehensible language vaguely sounding like English. Don’t be intimidated. Actually,the game of polo is similar to golf in its astounding simplicity. The Club offers private polo lessons through the year taught by the talented polo instructors Mark Prinsloo and Barlee Flanders. These pros help to develop the skill set of the club’s intermediate players as well as teach the sport to beginners. The Club offers polo school once each season, taught by local pros Barlee Flanders and Mark Prinsloo. This 8-week course is designed to take students from riding to playing in a fun-filled, group environment. The Houston Polo Club is proud to be home for more than 60 playing members and 20 plus professional players who compete and practice throughout the polo season. The Club offers a variety of leagues for all levels of players. The Club is fortunate to have a number of teams who return each season to play at the Houston Polo Club. Many of these teams are captained by patrons who began their polo careers here in Houston. The Step Up Program has something to offer all ages and abilities. We offer private polo instruction and polo school for our first time polo players. For the those ready to play in coaching chukkers we offer Margarita League. 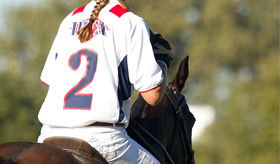 Those players ready for competitive tournament polo can join our exciting 2 Goal League!